There are several meanings to the word “goodwill,” depending on the context. This ambiguity was the basis for Axiom Worldwide, Inc. v. HTRD Group Hong Kong Ltd. 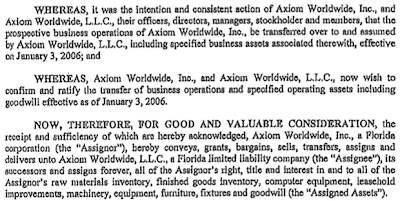 WHEREAS, Axiom Worldwide, Inc., and Axiom Worldwide, L.L.C., now wish to confirm and ratify the transfer of business operations and specified operating assets including goodwill effective as of January 3, 2006. NOW, THEREFORE, FOR GOOD AND VALUABLE CONSIDERATION, the receipt and sufficiency of which are hereby acknowledged, Axiom Worldwide, Inc., a Florida corporation (the “Assignor”), hereby conveys, grants, bargains, sells, transfers, assigns and delivers unto Axiom Worldwide, L.L.C., a Florida limited liability company (the “Assignee”), its successors and assigns forever, all of the Assignor’s right, title and interest in and to all of the Assignor’s raw materials inventory, finished goods inventory, computer equipment, leasehold improvements, machinery, equipment, furniture, fixtures and goodwill (the “Assigned Assets”). According to the defendant, Axiom LLC thereafter ran the business, including using the trademarks. In March 2010, Axiom LLC filed an assignment for the benefit of its creditors and ceased doing business. Progress Bank ended up with the assets of Axiom LLC and on July 1, 2010 it sold the assets to defendant HTRD. HTRD began using the marks. Axiom Inc. also used the marks, in competition with HTRD. HTRD claimed to be the owner of the marks based on Axiom Inc.’s transfer of the “goodwill” to Axiom LLC. Axiom Inc. claimed that the assignment to Axiom LLC was only of specified assets, i.e., the raw materials inventory, finished goods inventory, etc. Axiom Inc. maintained that the remaining assets, including the intellectual property, were to be transferred to a third party but the deal fell through and therefore it ultimately retained ownership. Axiom Inc. claimed to have continued to use the marks by licensing them to Axiom LLC and foreign distributors, although it later terminated Axiom LLC’s license. 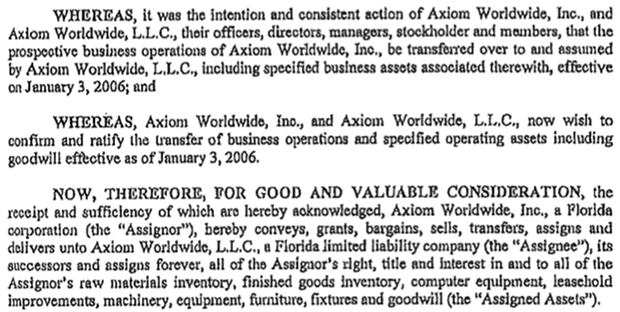 Thus, according to Axiom Inc., Axiom LLC had no trademarks that Progress, and thereafter HTRD, could have acquired. The court agreed with HTRD that “[w]here the entire stock of a business is purchased and the business continued under its original name, it must be presumed that the purchaser acquired the goodwill of the business together with the commercial symbols of that goodwill, the business’ trademarks and trade names,” even if the trademarks are not specifically identified as assets. However, a trademark may also be retained by the owner, even “[w]here the owner has sold its equipment, inventory and other assets, discharged its work force and announced it has discontinued manufacturing its products.” Further, if the transfer is short of the entire business and its assets, such that the transferor can continue operating within the same line of business, the trademarks do not pass inherently with transferred goodwill. On these facts, where Axiom retained some assets and continued to use the mark itself, the court found that HTRD was not likely to succeed on the merits of its claim of ownership of the marks. Therefore HTRD was unable to obtain a preliminary injunction to enjoin Axiom Inc. from using the marks. So what was the “goodwill” that was assigned? I expect they meant a broader type of goodwill than just that which can be attributed to a trademark – things like the value of already-existing business operations and established channels of trade. It was a bit of a long shot for HTRD, but understandable given that the bill of sale expressed the intent for Axiom Inc. to cease business operations. HTRD paid $400,000 for all the assets as-is, although it’s hard to tell how much the remaining assets were worth and whether that was a good deal even without the trademarks. A gamble for HTRD that didn’t pay off. Axiom Worldwide, In. v. HTRD Group Hong Kong Ltd., No. 8:11-cv-1468-T-33TBM (M.D. Fla. July 18, 2012) (Report and Recommendation).